Entering its 24th year of existence in 2014-15, the Peach Belt Conference has cemented its status as one of the elite Division II conferences in the nation. Since its inception in 1990-91, the Peach Belt has developed a consistent history of excellence which continues to this day with 33 national championships and 28 national finalists. The Peach Belt was less than a year old before capturing a national championship. The Columbus State golf team took the honor by winning the 1992 national crown, the first of three golf championships the Cougars own. One year later, the Lander men’s tennis team began their record-breaking run of eight straight national titles, the first PBC dynasty. Since then, USCA men’s golf has won three straight national titles from 2004-06. The PBC is in the midst of another dynasty as the Armstrong men’s and women’s tennis teams captured the 31st and 32nd national championships for the conferencer in 2012 and the 33rd in 2013. The Pirates have won five women’s and three men’s national championships since 2008. Armstrong’s achievement was the highlight to one of the most successful seasons in league history in 2012. Peach Belt teams advanced to the national championship round of competition in 10 of our 13 sports. The Armstrong women’s soccer team reached the final four while the Flagler volleyball team went to the Elite Eight. The Montevallo men’s basketball team played in the national championship game while the Lander women’s team reached the Elite Eight. The Flagler softball team reached the world series while the Georgia College and USC Aiken men’s golf teams reached the final eight match play at the national championships. In all, 59 Peach Belt teams made appearances in the NCAA postseason, including seven men’s tennis teams and six each in the sports of men’s golf and women’s tennis. The seven charter members of the conference were Armstrong Atlantic State University, Columbus State University, Francis Marion University, Georgia College & State University, Lander University, USC Aiken and USC Upstate. The name Peach Belt Athletic Conference was adopted in January of 1990 and modified to Peach Belt Conference in May of 2000. Augusta State joined the conference in 1991 and UNC Pembroke became the ninth member on July 1, 1992. They were followed by Kennesaw State University on July 1, 1994, Clayton State University on July 1, 1995 and the University of North Florida on July 1, 1997. Kennesaw State and North Florida departed for the Division I ranks in 2005, USC Upstate did the same in 2007, and the conference welcomed in North Georgia College & State University in 2005 and Georgia Southwestern State University in 2006. 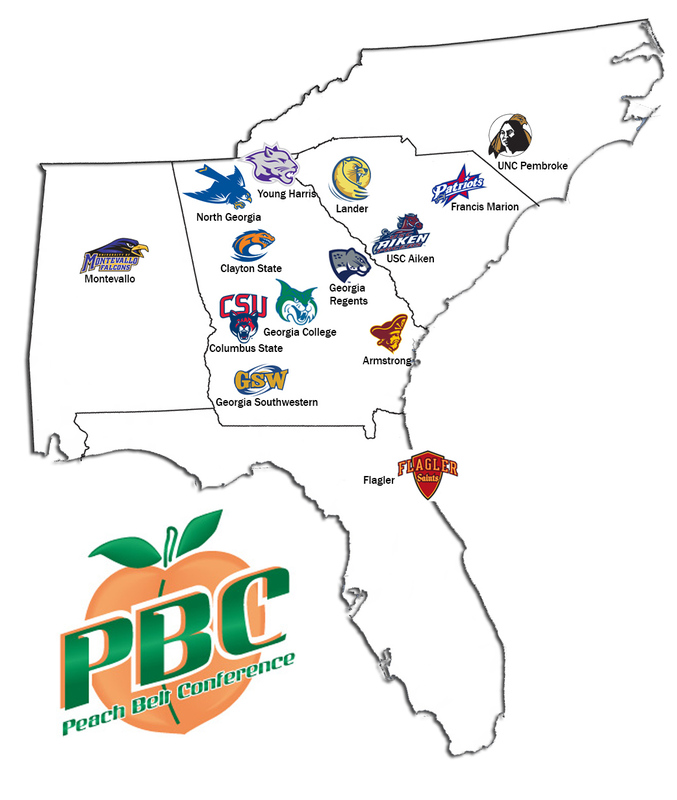 In 2009-10, the Peach Belt added Montevallo and Flagler. In the 2012-13 season, the league is expanded once again with the addition of Young Harris College, giving the Peach Belt 14 members for the first time in its history. The conference currently holds championships in 15 sports, seven for men and eight for women. They are men’s and women’s cross country, men’s and women’s soccer, volleyball, men’s and women’s basketball, men’s and women’s tennis, baseball, softball and men’s and women’s golf and men’s and women’s track and field.